The Minister of Security, Mauricio Ramírez Landaverde, reported recently that in the first four months of 2017, El Salvador had recorded 1087 violent deaths, a reduction of 55% in comparison to the 2346 reported during the same period during 2016. During April 2017 there were 291 homicides; an average of 9.7 homicides each day, a reduction of 43 homicides from the same month in 2016. Landaverde attributes the reduction to the impact of the "exceptional measures" which the government began deploying in the first half of 2016. 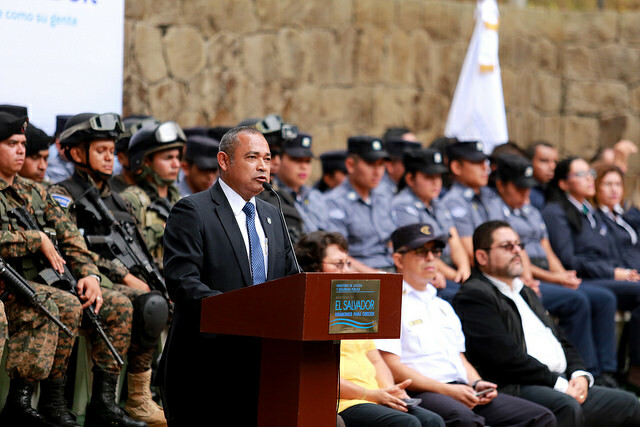 At the same time, Landaverde reported that the police had arrested and detained 34,425 suspects during the period from June 2016 to the beginning of May 2017. That's a very high number in this country of just six million people. No statistics were released on how many people were convicted of crimes during that period or were released by the courts for lack of evidence. The lack of investigative capacity in the country has meant that many are arrested without facts to support the arrest. With a sustained period of twelve months of declining homicide rates, the government can probably take credit that its very repressive measures are at least partly responsible. The security forces are still killing multiple alleged gang members in daily confrontations. The prisons remain in obscenely overcrowded conditions. But the government is celebrating that the daily body count has dropped to a more "normal", but way too high, 9-10 murders murders per day. Watch the Ministry of Security's video announcing reductions in crime levels here.